On December 3, 2018, the Urban Land Institute a report titled Agrihoods: Cultivating Best Practices, illustrates strategies for creating successful real estate projects centered around farms and other food production spaces. The report identifies eight best practice areas to aid developers and their partners in planning, creating, and operating agrihoods, defined by ULI as single-family, multifamily or mixed use communities built with a working farm or community garden as a focus. The best practice areas include land, food, finance, programming, communications, housing and design, people, and partnerships, and the report outlines specific strategies in each area to help projects maximize their health, sustainability, equity and economic potential. These strategies were gleaned from ULI research, interviews with developers and other experts, and from a workshop with key leaders in the field. The report includes brief profiles from agrihood projects around the country, as well as insights on food distribution, farm skills, programming, and other topics. It offers compelling schematics that illustrate common agrihood features. 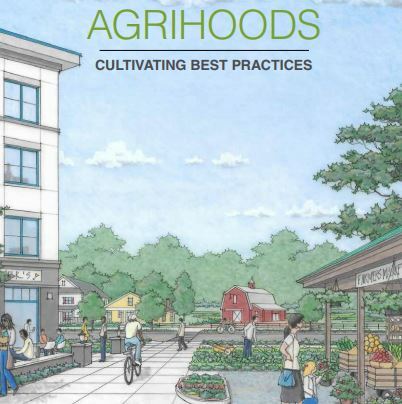 See “Agrihoods: Cultivating Best Practices” report (PDF).